A leading health expert has said that it's important for all healthcare workers to pay attention to needlestick injury prevention measures, and realise the dangers posed by percutaneous injuries. Dr John O’Keefe, BDentSc, MDentSc, MBA, Board Chairman, Organization for Safety, Asepsis and Prevention (OSAP), highlighted the importance of safe injection and sharps management practices for everyone working in the healthcare sector, especially dentists. Writing for the Center for Disease Control and Prevention (CDC), Dr O'Keefe stated that as these practices are a vital part of dentistry, the One & Only Campaign is strongly relevant to people working within the industry. The One & Only Campaign is a public health campaign, led by the CDC and the Safe Injection Practices Coalition (SIPC), to raise awareness among patients and healthcare providers about safe injection practices. Its main aim is to reduce and eradicate any outbreaks that occur from using unsafe injection practices around the world. Dr O'Keefe stated that the OSAP strongly supported the campaign and pledges to spread the message of the initiative - to encourage safer sharps practices - to its members, as well as sharing information on how leading experts in the dental care sector can promote safe injection practices with the rest of the healthcare sector. The expert recalls his own experience of the importance of safe injection practices and how they relate to creating the safest healthcare environment possible. When Dr O'Keefe first joined a practice, he saw partially-used local anesthetic carpules from an old practice and reusing them in his new office. Since then, the OSAP has been abiding by the current and emerging infection control guidance and regulations, as well as helping the rest of the sector by giving practical advice, and providing education to professionals within dentistry. Although much work has been done to ensure that healthcare workers are exposed to the smallest amount of risk as possible when doing their role, Dr O'Keefe cited a recent event where unsafe practices led to the first documented report of patient-to-patient transmission of hepatitis C in an American dental setting. This, according to the expert, shows that there is still much progress to be made to further encourage safe injection and sharps practices. This week marks European Immunisation Week. 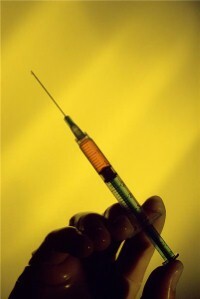 Sharps are one the main risks people working in healthcare face. A guide to dealing with a needlestick injury to prevent further harm.